There is no denying that Jeep hit a performance home run with the release of the 2006 Grand Cherokee SRT8. No holds barred, it was one of the fastest SUVs on the planet when it was first released. It was the envy of the world and with a base sticker price of $39,995, most performance car fans could afford one. As a comparison the 2006 (4×4) Grand Cherokee Overland, Jeep’s top luxury model that year, had a base sticker price of $42,480. Even when the 2006 SRT8 was loaded with all the options it never exceeded a sticker price of around $45,000. The SRT8 rocketed down the quarter-mile in the low-13 second range and had a sophisticated all-wheel drive system it didn’t share with any other Jeep model. Its 6.1 liter HEMI V8 produced 420 horsepower and 420 lb-ft of torque. It was a text book example of an automaker giving power to the people for a very low price. Fast forward to the 2014 model year, and the Grand Cherokee SRT is still going strong (the SRT8 moniker has been changed to "SRT"). 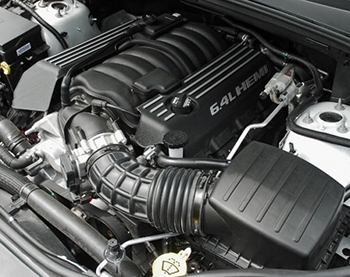 Today power is provided by Chrysler’s 6.4 liter (392 CID) HEMI V8 which produces 470 horsepower and 465 lb-ft of torque. Who could ask for anything more? Well not exactly, things have changed, the SRT is very pricey when compared to the original SRT8. In fact the price change has been so dramatic that the average Joe can’t afford one. The SRT now has a base price of $63,195 which is a price increase of 37 percent in eight years. As a comparison the 4×4 version of the 2014 Grand Cherokee Overland has a base price of $46,195 which is a price hike of only 9 percent since 2006. There is a more luxurious model above the Overland now, which is Grand Cherokee Summit, (in 4×4 form) it has a base price for 2014 of $50,000. So why is the SRT a little over $13,000 more than the top luxury Grand Cherokee? It makes no sense except for the fact that even at $63,195, the SRT is the fastest SUV for the money and quite frankly there’s nothing in the SUV segment even close to this base price that has as much horsepower or handling prowess. The Summit has the sheer luxury, interior feel, acceleration, and overall classiness that would put to shame the top-of-the-line Range Rover, however its top motor is a 360 horsepower (390 lb-ft torque) 5.7 liter HEMI V8. This is more than enough power to send occupants back into their seats during hard acceleration but it lacks the cheetah speed of the SRT which is packing 110 horsepower and 80 lb-ft of torque more. Truth be known back in 2006 some Jeep dealerships were charging as much as $55,000 for the original SRT8 due to dealer markups during the first few months of production and buyers were paying the asking price. However prices did drop back down, and most buyers of the original 2006-2010 SRT8s paid sticker price for theirs. The good side is with the current SRT, it’s possible to get one for under sticker. This writer travelled to a few local dealers and was quoted take home prices (before taxes and tag fees) of a few thousand dollars under sticker. One local Jeep dealership even quoted a price of just over $65,000 for a loaded SRT with a sticker price of $72,225 – so good deals are available. Let’s look back again at the 2006 Grand Cherokee SRT8, it was a sharp looking vehicle on the outside but on the inside the interior was good by American SUV standards, but comparing the materials and overall look and feel of the interior to the best European SUVs at the time, there was no doubt this first SRT8 was substandard in this area. These were the days of Daimler ownership, and it was quite clear that the best interior materials at Daimler were reserved for Mercedes SUVs and not Jeep. In recent years with the new Fiat ownership things have changed. Fiat is not only allowing Jeep to go upscale with the new Grand Cherokee and its SRT model, it encourages the use of the best materials money can buy inside the interior cabin, and when viewing the SRT interior the extra effort really does show. No more cheap plastic look, all interior materials are now Neiman Marcus quality. The interior has just about every bell and whistle you can imagine. The dashboard layout is among the best you are going to find in a SUV, the readouts not only are easy to read but will have you staring at them in awe. And you can customize the gauge visuals according to your own tastes – for instance if you want a digital speedo readout you got it, or you want to change to a traditional looking round analog looking speedo that is also a click away. And if you want to find out how many g’s or how fast in seconds your SRT is accelerating all that information is there. All interior buttons and levers are placed where they should be and everything including the big touch screen navigation system works flawlessly. And with the SRT even though it doesn’t have the top shelf woodgrain dash surfaces of the Overland or Summit, Jeep’s use of metal and carbon fiber in the SRT supplement very well the extremely luxury standard leather seats (with suede leather inserts) and other appointments in the interior – giving an overall classy but sporty look. In other words a buyer won’t in any way feel slighted in a SRT interior versus the Overland or Summit interior. The seats provide excellent lateral support which is important in very tight turns. The original SRT8 had good lateral support however the sides of the front seats were so hard when you went into a serious of hard turns at high speeds it felt like Mike Tyson was punching both sides of your body. No more with the current SRT, the front seats keep the occupants bodies planted while still treating them to the comfort of a comfy couch. Even with all this opulent luxury, Jeep offers a step up with the $1,995 High Performance Laguna Leather Seats – upscale pumpkin colored leather seats (with pumpkin colored leather trim in other areas of the interior) catches your attention but the absolute comfort and high quality of the leather will have you wanting this expensive option. The thick leather steering wheel fits both hands hand like a glove. And even with the streamlined roof, those over 6 feet tall have plenty of head room and excellent forward, side, and rear visibility. The interior looks and feels great. The original SRT8 was fun around town but had you hating a 3,000 mile cross-county U.S. trip (the seats were too rough and so was the suspension), the much more civilized 2014 SRT will have you begging for any reason to take this long trip. The 2014 Grand Cherokee has become more European in exterior appearance. The Audi-like headlights, the more feminine smooth body contours are a move in this direction. Jeep continues the absence of the much needed 2006-2010 Grand Cherokee side door guard strips. This is where styling won out over function, the old Jeep mindset would have never allowed this to happen. And SRT owners may wish Jeep never removed the strips when they find their first door ding which could have easily been prevented had the strips been present. In other words beware of tight perpendicular parking lot spots – they will yield dings and dents on your beautifully sculpted doors. Fortunately the traditional Jeep front grille is still there. 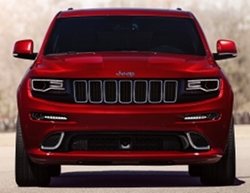 Jeep made the SRT much more muscular in appearance than the other 2014 Grand Cherokee models. In fact this iteration of the SRT is much more masculine and muscular in appearance than any other previous Grand Cherokee SRT8 models. The beautifully shaped lower front air dam is nicely integrated into the body and yet it has plenty of ground clearance about double that of the original SRT8 which only had about 6 inches of ground clearance and was guaranteed to scrape on every large speed bump and hump the old SRT8 encountered. The SRT’s Viper like hood with twin large air holes screams "HIGH PERFORMANCE". The above rear window spoiler also helps with this image. However it’s the blacked-out front grille and headlight area that give this car a modern muscle car type of look. The bright narrow chrome grille trim nicely contrasts this almost entirely black area. The SRT also gets a set of ultra modern looking parking lights to go with the Audi style headlights. The dual exhaust tips are nicely styled and integrated into the SRT’s lower rear area – they are more conservative in nature than the outlandish boy racer dual tips of the original SRT8. Standard is a set of 20 x 10 five-spoke Goliath wheels. Optional are 20 x 10 inch forged aluminum Spider Monkey wheels. Also optional are Spider Monkey wheels finished in black chrome which are a must have for any SRT buyer – by far the best looking wheels on the SRT. And the massive Pirelli Scorpion Verde all-season performance run flat P295/45ZR20 tires give the SRT a performance car like stance. However the real reason for the SRT’s existence is the 6.4 liter HEMI under the hood. Surprisingly, visually it’s more understated than the 6.1 liter HEMI that was found in the original SRT8. The 6.1 HEMI engine block was painted in HEMI orange (the same color of the legendary production 1966-1971 426 CID HEMI V8 block). The 6.1 HEMI intake manifold was wild, the engine was a show piece. By comparison the 6.4 HEMI is boring in appearance, for a high-performance V8 it’s look is pedestrian – everything is flat black. Even the mundane silver lettering stating "6.4L HEMI" on the flat black plastic engine shrouding above the valve covers doesn’t really create any emotions. This engine judged on appearances is as boring as an actuary convention in Omaha. But looks can be deceiving, pressing the ignition button fires up the torquey large displacement V8. Driving around pressing lightly on the aluminum racing style accelerator pedal will make you feel in control – you realize that you have plenty of power under the hood. However it’s when you press the accelerator to the floor you fully understand this motor roars like thunder and moves the heavy 5,150-lb with lightning response. The Grand Cherokee moves from 0-60 mph in 4.6 seconds and down the quarter-mile in just a tick above 13 seconds. And unlike a lot of vehicles with a high-horsepower engine the ultra-sturdy and rigid Grand Cherokee chassis handles the mega horsepower and torque with no squeaks, rattles, or other strange noises. Even more impressive is how the SRT launches so fast with no loss of traction due the grippy 4-wheel drive system. You turn the steering wheel the SRT moves exactly where its pointed with no fuss. With skidpad handling of .90 (making the SRT the best handling Jeep ever produced), the SRT hits the tight hairpin turns wth ease and feels as light on its feet as a $130,000 2014 Viper GTS. The large 4-wheel Brembo brakes stop the portly SRT on a dime (60-0 happens in just 112 feet). Unlike the first generation SRT8, the new SRT is actually functional in the real world. The 4-wheel drive system has different modes depending on the driving condition which even includes a "snow" mode (among the different modes is also auto, sport, track, and tow). In other words this is a performance vehicle that tackles the worst types of rotten driving conditions (including inclement weather) on any road (notice I said "road" not "off-road") with ease, along with giving you the best possible handling when in track mode. And you can even tow up to 7,200 lbs with the optional towing package – something unimaginable with the original SRT8. The SRT is standard with performance oriented 3.70 rear gears. When the first SRT8 made its debut, the standard 5-speed automatic with manual shift mode made you wish for a manual transmission option. The 5-speed automatic is gone and replaced with a state of the art 8-speed automatic – there’s still no manual transmission but no worries you’ll never miss the manual especially once you start using the steering wheel paddle shifters. The 8-speed shifts so smooth and seamlessly and always finds the right gear, it will surely win over your heart. And unlike the original SRT8 which had a EPA highway mpg rating of 16, the 2014 SRT which weighs 400 lbs more and has 50 horsepower more has a EPA highway rating of 19 mpg due to this new transmission (and the 6.4 HEMI’s cylinder deactivation system). Now that’s progress. And for those who insist on owning the fastest SUV on the planet or 470 horsepower won’t cut it, they only need to pony up another $20,000 for the 650 horsepower Hennessey modified 2014 Grand Cherokee SRT which will set a buyer back no more than $90,000. Everyone knows somebody in their lifetime who obtains success or becomes famous and then soon thereafter forgets their friends and family and decides to only be seen with the rich and famous. 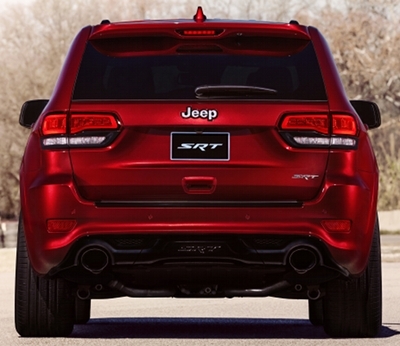 The 2014 Grand Cherokee SRT is exactly this type of character. If you don’t have the money honey, the SRT doesn’t want you around. Who knows why the change in policy at Jeep concerning the SRT, perhaps its the new bosses at Fiat who are forging the new direction – the European attitude has always been real high performance cars are reserved for the rich. Never-the-less one can’t help and wonder at this rate of price escalation how soon will it be before the SRT tops the $100,000 mark (unfortunately the SRT is such a great overall flawless vehicle that there would be plenty of buyers lining up to pay six figures for one – please don’t let Jeep know this). Right now the higher price strategy is working for Jeep, there are plenty of buyers lining up to buy one. Even with a sticker price of a heavily equipped with options SRT touching $72,000, the SRT is still the fastest and best performance SUV you can buy for the money. So for those well-healed buyers trading in their Porsche Cayenne Turbo and Range Rover Sport on a SRT, they are getting a great performance bargain with so many other added benefits – in other words they aren’t sacrificing but gaining more with the SRT. However for the original SRT8 owners, they will unfortunately have to wait until at least 2016, to buy a used 2014 SRT when its market price drops due to normal depreciation before they can afford one. It’s a sad story for the average Joe. However it’s good news for Jeep, the brand has finally arrived to upper society, with the SRT it can now compete toe-to-toe with the most exotic foreign SUVs. The Grand Cherokee SRT has lost all the flaws of the original and not only matches its more expensive Range Rover, Porsche, Mercedes, etc. competition; it beats every one of them in sheer class. The competition in the high-performance SUV segment has become crowded compared to when the first SRT8 arrived on the scene, with some SUVs making more horsepower than the 2014 SRT (some even far exceeding 500 horsepower). This is irrelevant, Jeep has finally arrived, no one can point the finger at the SRT and claim its substandard in any category, it simply is the best and most well rounded performance SUV hands down even when money is no object. Don’t believe me, stop by (driving a 2014 SRT) the nearest country club where the local elites congregate, not only will the members not snub their noses at you, they’ll wave and smile – they will think you are a VIP. Even if you turned off the automatic traction control and executed a parking lot burnout, they would probably stand up and cheer.